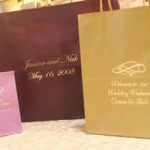 Welcome Hotel Bags: If many of your guests are staying at a hotel the evening of your wedding day, you want to ensure they are greeted with something special. A Personalized Welcome Bag filled with great treats is a great way to remind guests that the party is already getting started and that you are thankful they are there to celebrate with you. 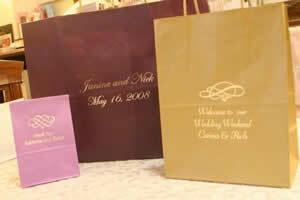 You can also customize these bags to make them unique and just for your wedding. Some useful items we recommend to add are: Water, Snacks like popcorn or a healthy bar, gum or mints & maybe some Advil (for the morning after). Rose Cones: Once your guests have watched you and your now hubby say I do, they will head out to watch you make your first grand appearance. Since no one actually throws rice anymore, guests receive these cones filled with flower pedals, in place of blowing bubbles after you leave your wedding ceremony! 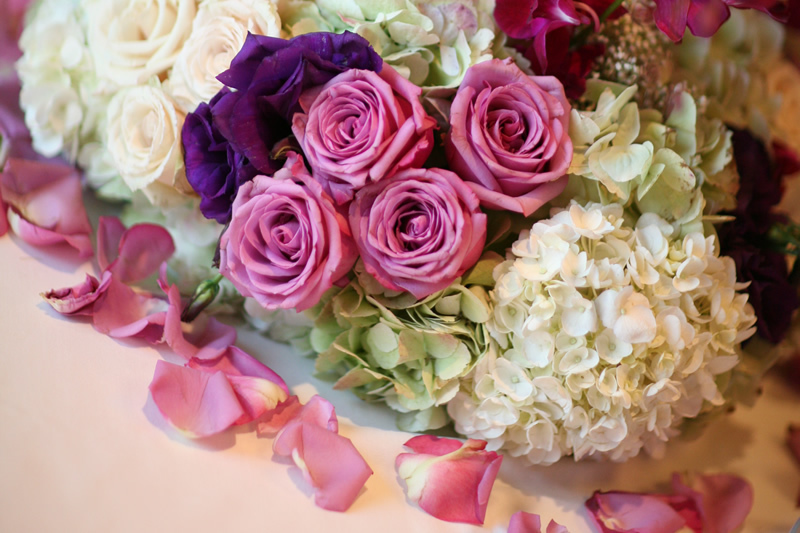 We love adding these elegant rose cones to your post ceremony. All of your guests will feel so a part of the celebration by being able to throw these rose petals into the air and the moment creates an Amazing Picture. Plus, our Rose Cones are made of biodegradable paper with embedded wild flower seeds and are embellished with beautiful colored bows of your choice. 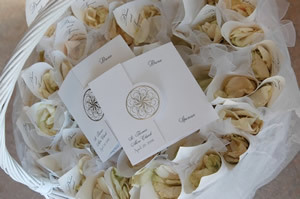 After they are used, the guests can actually plant the Rose Cone paper and watch wild flowers grow!!! The directions to plant the cones are actually printed as a pretty poem on the inside of the cones below the couple’s names. Every year when the wildflowers bloom, everyone will be transported back to the joy of the day & fun that was had celebrating your wedding!! Fun Fact Napkins: The party is about to begin and your guests are heading into the cocktail hour. 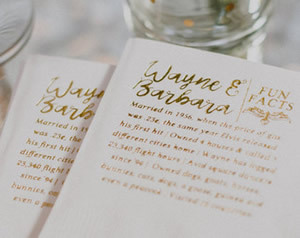 They are enjoying the endless amount of passed hor devours and sipping on a delicious drink when they see these cute and creative napkins that you have designed & personalized to have “Fun Facts” about you and your new hubby. 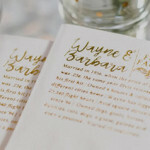 They are a simple touch but will make the cocktail hour fun with people trying to read all the different napkins filled with your love story. 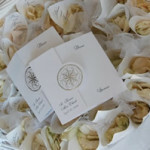 Envelope Holder: Most of your guests will be walking into your special day with a card filled with kind words and messages of love. Since the first thing many want to do is ditch this envelope before grabbing a cocktail, having the perfect envelope holder is crucial. 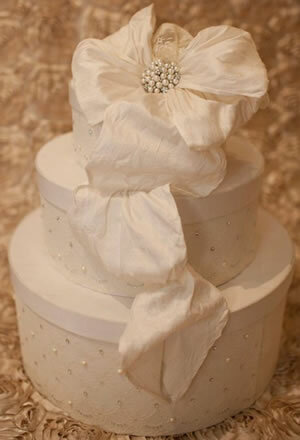 This is a place where most guests will go and it will express your style or theme. Start researching now if you feel bling is your thing or a more traditional treasure chest or cake envelope holder speaks to you. 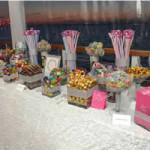 Candy Table: The night you have been dreaming of your whole life is starting to come to an end. The cake has been cut and final dances are being had. 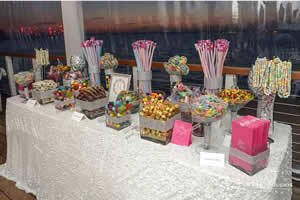 A great statement to catch people’s eye is an extravagant, fun candy table. This extra treat will have guests out of their seats and give them something sweet to take home and enjoy. 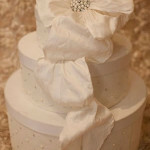 If you are inspired to add some of these special touches to your wedding day, we are here to help! Take advantage of our 20% off Sale on these items for the month of April. All you need to do is make an appointment, reference this blog post, and you are ready to go!